Prince George’s County, Maryland, has been hard-hit by the housing crisis. In the first half of 2012, six of every 100 homes in Prince George’s County entered foreclosure proceedings. In 2011 nearly one in six began the foreclosure process. In the last 18 months in Prince George’s alone, over 49,600 families lost or faced the loss of their homes. How can a community best tackle so pervasive and fundamental an economic crisis? NeighborhoodInfo DC has amassed a toolkit of expert analysis, easy-to-use datasets, and interactive maps designed specifically for community organizations, neighborhood leadership and residents, and government. Our interactive map highlights the foreclosure hotspots in Prince George’s County and show how foreclosure activity has changed over time. The latest brief analyzing Prince George’s foreclosures shows that different areas of the county experienced the crisis in different ways and to different degrees, concluding that a one-size-fits-all approach is likely not the most effective. Ultimately, though, it is the community leaders and elected officials of Prince George’s County who know its needs and issues best and are best placed to design long-term solutions. 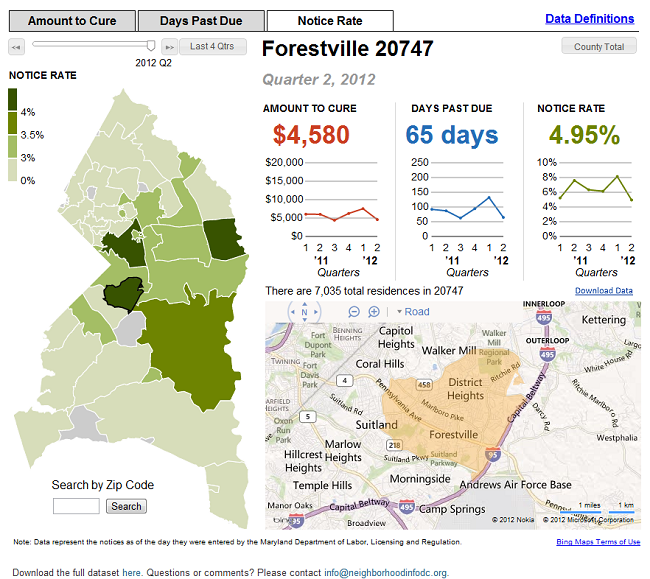 To that end, our data and interactive maps—updated through second-quarter 2012—can be found on NeighborhoodInfo DC. These current, targeted neighborhood descriptions can be used, for example, in conjunction with a Foreclosure-Response.org resource-targeting framework to determine a neighborhood’s optimal housing policy based on the strength of its housing market and its foreclosure risk. NeighborhoodInfo DC will continue updating and adding to these tools, starting with another blog tomorrow. It will highlight the latest brief’s special focus on the few nationwide mortgage servicers responsible for the overwhelming majority of foreclosure activity in Prince George’s County.